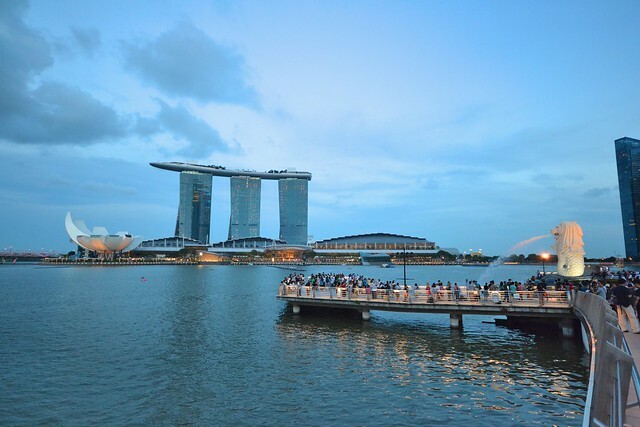 Singapore is a quick international getaway for Filipinos. A lot of Filipino travelers even consider the country for their first overseas travel. With Singapore as a prime destination in the region, tons of activities are waiting to be discovered especially for Singapore first timers. Going through the immigration on my first Singapore trip was a bit nerve-wracking but I still managed to get my stamp and set foot in this Southeast Asian country. Marina Bay area with the Merlion Park, Marina Bay Sands Hotel, and the lotus-shaped Singapore Art Museum. With two separate trips, I think I already had enough exploring Singapore’s must attractions and activities to try. To help first-time travelers, here’s a list of things-to-do that you should include on your Singapore itinerary. 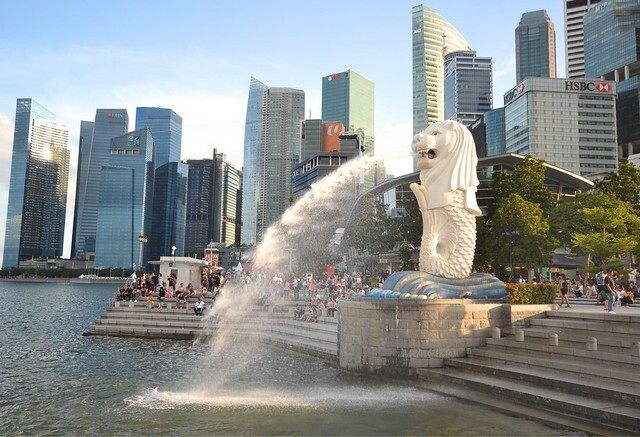 Singapore created a mythical creature that served as their main marketing icon, the Merlion. Merlion is a landmark in Marina Bay with the statue composed of a lion’s head and a body of a fish. The icon also serves as a personification of Singapore, hence the merchandise sold all over the country. With that, it’s a must to take a picture with the Merlion on the background to prove to your friends that you traveled to Singapore. It was funny sometimes to watch tourists posing for creative shots with the landmark. 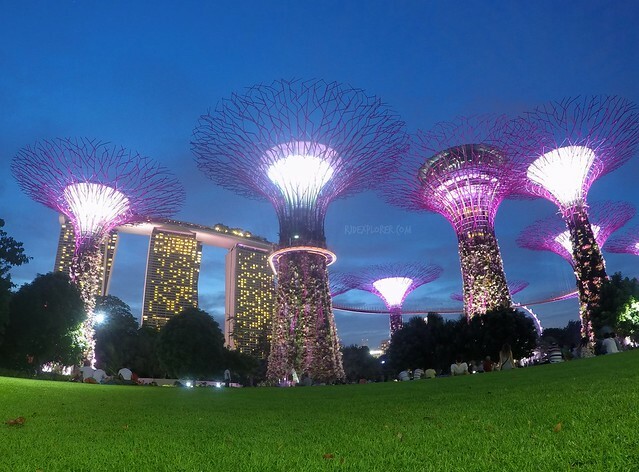 Another spot that makes Singapore prominent is the Gardens by the Bay located just across Marina Bay Sands Hotel. The Supertree Grove, one of the highlights of the garden, towers over the 101-hectare garden. The futuristic trees, between 25 and 50 meters tall, have canopies that usually provide shades to visitors. Purchasing a ticket for the OCBC Skyway, a 128-meter aerial walkway, will allow you to scale two of the supertrees and be stunned by the aerial view of the marina area of Singapore. If you still have time to spare, you could also consider buying a ticket to enter Cloud Forest and Flower Dome, both added attractions of Gardens by the Bay. Supertrees of Gardens by the Bay during Garden Rhapsody Light Show. When I had my first trip to Singapore, Universal Studios Singapore was one of my priorities. Having my USS ticket booked from Klook, I skipped the long queues of the ticketing booth straight to the theme park’s entrance. Expect hordes of tourist visiting the park especially on weekends so it’s better to plan your way around the theme park’s attractions and rides. I’ve published a post on how to hack your way out of long queues and maximize your day at Universal Studios Singapore based on my observations on my visit. For must-ride attractions, please check my separate post. 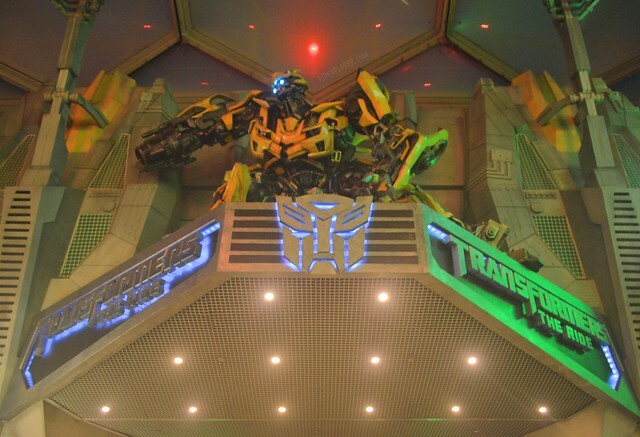 One of the must-ride attractions of Universal Studios Singapore is Transformer: The Ride. 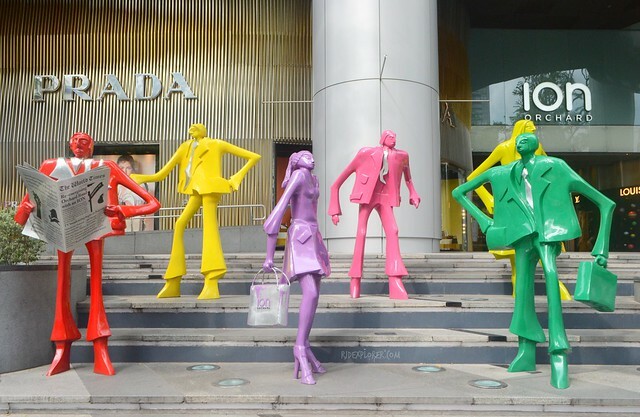 Orchard Road is a renowned shopping district of Singapore from luxury brands to fashion and apparel outlets. I just window-shopped on my stay because I was traveling on a budget and my major goal at Orchard Road is the art trail. Few hotels and shopping malls installed sculptures and other kinds of arts on their front yards making the Orchard visit really an art appreciation activity. Check out my Orchard art trail starting from Regent Singapore up to Winsland House. If you’re worried about dining knowing that Singapore has a high cost of living, don’t fret because hawker centers are everywhere in the city. One of the prominent hawker centers is the Maxwell Hawker Center, very accessible to Chinatown’s Pagoda Street. The food hall has several rows of food stalls serving affordable yet filling food from Singaporean, Malaysia, and Chinese cuisines. You can avail a bowl of laksa for SGD3, two rolls of Popiah for SGD2.5, and beverage for as low as SGD1.5 like the barley and sugarcane drinks. 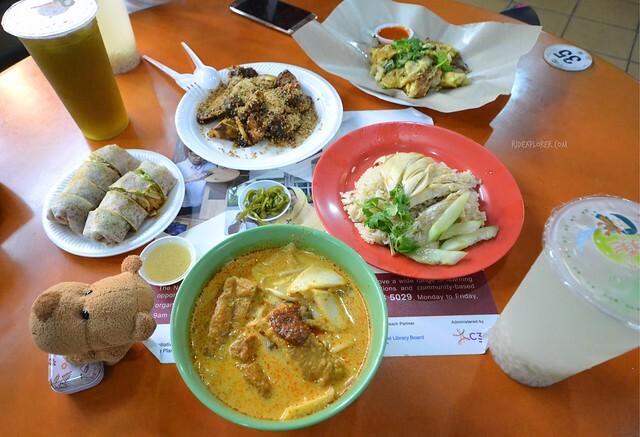 Your SGD10 food budget can go a long way when dining at Maxwell Hawker Center. Food feast at Maxwell Food Center. Others usually raise an eyebrow if I mentioned that Singapore has a UNESCO World Heritage Site. With the urban development and skyscrapers, many wouldn’t believe that Singapore Botanic Gardens is part of the heritage list. It’s the only heritage site in the country but what’s interesting is the botanic gardens being the first tropical botanic garden on UNESCO’s list. Spend a morning or whole day walking and strolling around the different sections of Singapore Botanic Gardens. If you’ll check online about Singapore’s culture, you’ll find out that it’s a combination of Asian and European cultures. Some consider Singapore as the melting pot of Southeast Asia because of the influences and others also tagged the country where the “east meets the west”. 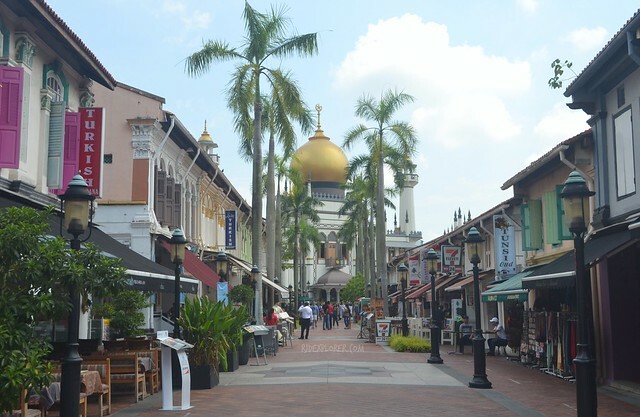 With these influences, three heritage districts of Singapore stand out on the tourism map: Kampong Glam, Little India, and Chinatown. These districts have their own offerings of food, landmarks, and activities. Spend the entire day hopping from one heritage district to another on Singapore’s efficient train network. Nature parks are a thing of Singapore. The country has an agency tasked solely to maintain and monitor all nature parks in the city. It’s great to see its government exert effort in balancing the ecosystem of Singapore despite the urban development. 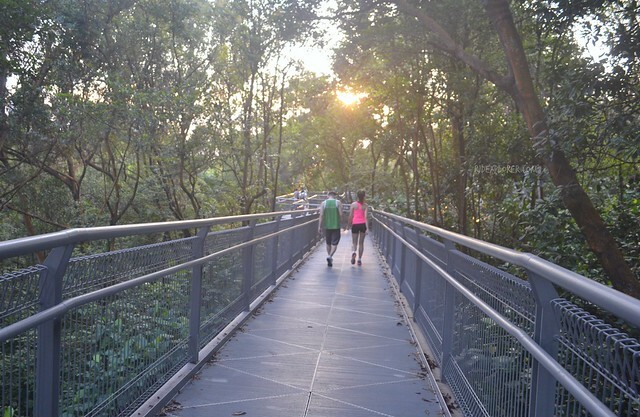 One of the largest nature parks is Southern Ridges, a 9-kilometer trail that connects gardens and parks of Singapore. Apart from the green spaces, there are also bridges and trails perfect for afternoon walks for tourists. You can start your walk from Henderson Waves, an artistic wooden bridge and considered the highest pedestrian bridge in Singapore at 36-meter high from Henderson Road. Beautiful canopied walkway at Southern Ridges. Singapore is a small country in terms of land area. But the attractions to visit and activities to do make a week seems too short for exploring the country. At first, I considered Singapore an overrated international destination because of the hype I hear from travelers. I was also hesitant to visit the country because of the cost of living. But I was surprised to find affordable places to stay and cheap hawker centers for nice meals. Meanwhile, not all activities in Singapore require hefty cash. Some of the activities mentioned in this post don’t even require admission fees for entry.